The Hall of the Chosen!!! What can be said about her that hasn't been said before a thousand times? Her name is Ruri Hoshino and she is the eleven year old pilot of the battleship ND-001 Nadesico. Of course, no one who enjoyed Martian Successor Nadesico could forget her famous line, "Baka baka?" However, she is much more than just that one line. She was raised from her artificial birth to be of superhuman intelluctual power, and for all effects and purposes had no childhood. She can actually pilot a giant battleship with a crew of over three hundred single-handedly. On top of that, she can sing well too! So if you want me to sum up why she's in the Hall of the Chosen: She's cute, she's not a two-dimensional female, she's cute, unlike most anime characters she doens't think she's always right (she knows it), and... she's cute. What is it? Its Yoshitaka Amano! Haven't heard of him? Did you play Final Fantasy III (VI in Japan, I think). Did you watch Vampire Hunter D? Perhaps Casshan, Tekkaman (Teknoman to the United Americans), or Gatchaman/G-Force/Battle of the Planets? This man was the character designer! This is one those designs, specifically for Vampire Hunter D. Thats D and Doris, presumably escaping from an evil vampire castle. You may not have known it, but you've probably seen his distinctive style somewhere. Many of his paintings are actually taken from old novels before they are turned into animated films. Vampire Hunter D by Hideuki Kikuchi is of course an example of this. So are Tenshi no Tamaga/Angel's Egg and 1001 Nights. No, this time its not Yoshitaka Amano. This is the mysterious art of the Super Deformed! 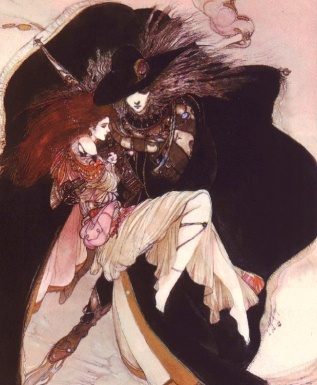 This, of course, is again Vampire Hunter D. The image was chosen to contrast the previous one. Does this seem unfamiliar? Maybe you haven't been watching hard enough! Super Deformed Devil Man is out there and ripe for the picking! Or perhaps you'd prefer a serious drama like Record of Lodoss War. Its there too, in these little shorts at the end of episodes. My personal favorites are the Blue Seed super deformed shorts though. And if you still feel you haven't gotten your fill of the super deformed, go rent Dragon Half. Its an artistic documentary highlighting the differences between regular anime style and the super deformed style. Done with the Hall of the Chosen? Check back for it will periodically be updated. Feel free to return to the main page. Or you could mail me at ruri_ruri@yahoo.com. All images are used to promote that specified topic and are not meant to infringe upon any copyrights. If there is a problem, please write to me.